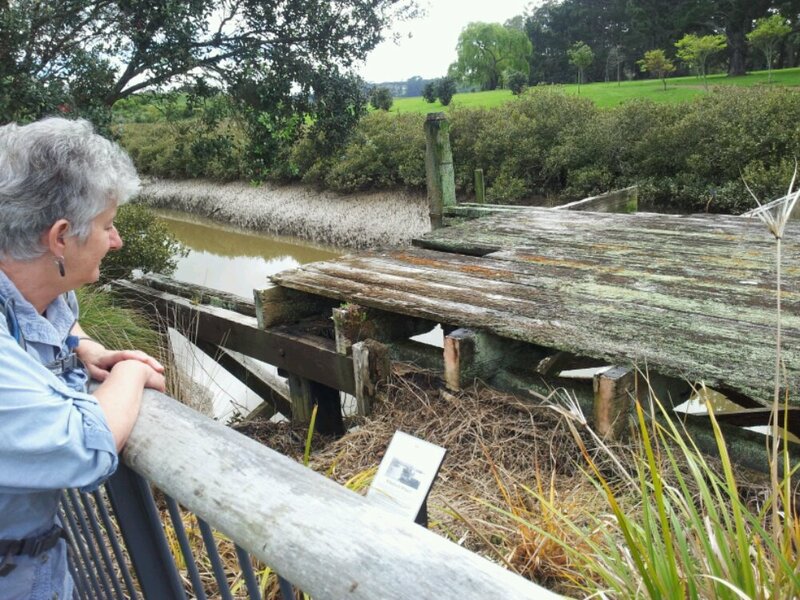 The tide was out today, so we packed our hiking gear and set off soon after breakfast, intending to explore the track down the left bank of the Turanga creek in Whitford that we spotted when kayaking recently. 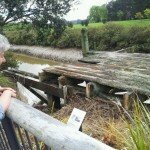 The first photo is Felicity looking at the remains of the Whitford wharf, where ferries from Auckland used to dock before the estuary silted up. The track turned out to be only 20mins each way, but it was very pleasant, and will improve when the extensive planting gets mature. 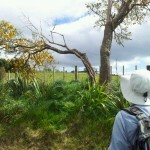 The kowhai tree in the photo looks just about dead, but it has masses of blossom. We jumped back in the car, and spent the next hour exploring all the no-exit roads to the north that lead down to the creek. Some of them had short tracks to the water, but there is no foot access along. 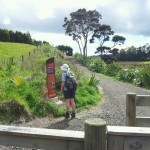 Over the hill and down into the Mangemangeroa valley, I spotted a path below as we crossed the bridge. We parked up the hill a bit and walked down, to find that we could go either way. 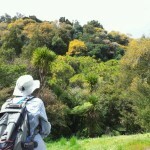 At first we walked upstream, enjoying the carpet of yellow kowhai petals on the ground, and the hundreds of tui partying it up. We ended up on a road, but we had passed another entrance on our right so we walked down the road until we found it. Re-tracing our steps for a ways, we then followed the path under the bridge and along the bank of the Mangemangeroa till we arrived at Somerville Reserve. By this time we were both hungry, so we were glad to sit at the sheltered lookout and and eat our sandwiches. For the first time on this trip, we could look at a signposted map, which showed us a section of trail heading further downstream. We’ll just have to come back another day. 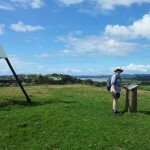 We followed a loop up to the trig at the top of the hill, and past the barn and car park for the park. Just the other side of Somerville Rd is deepest suburbia, so this feels right on the edge of the city. 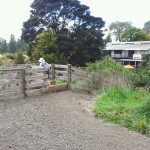 The southern side of the creek is all huge mansions on manicured lifestyle blocks. We’re both looking forward to coming back with our kayaks, to see how far up into the bush we can get. 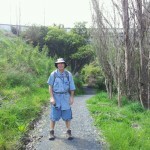 We keep getting surprised when we find new Auckland walkways that we never knew existed.